After Tests, Team India achieved another glorious feat, as they became numero uno in ODIs too. The year 2017 has been a great year for Indian cricket with the exception of painful departure of Anil Kumble as the Head Coach. It all started with a 2-1 victory over England in ODI series. And, the winning streak continues. India reached the Final of ICC Champions Trophy undefeated, but lost out to arch-rival Pakistan to end up as runners-up. Putting that loss behind, India prevailed over the West Indies with a 3-1 victory. And, the win came on the Caribbean soil. India won the Test series 1-0. Later, India toured Sri Lanka and completed a 5-0 whitewash for the first time on foreign soil. India also won the Test series 3-0. The victory march continues against the mighty Aussies too. 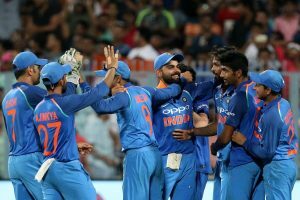 India have already taken an unassailable 3-0 lead in the five-match ODI series. Captain Virat Kohli & his team has been unstoppable so far. Hope they end the year on a good note!